The decade of 1916-1926 was one of slow but steady progress. The mounted ranger changed to automobile transportation and some modern equipment was introduced each succeeding year. The dirt roads gradually were transformed to modem highways and traffic moved the year ’round. Now we have come to a new era. The steady increase of visitors to the Park required a long range program to provide the facilities necessary and the maintenance of them. The protection of the Park has become more of a problem each year. More rangers were needed as well as other personnel, so the permanent and seasonal help has been increased from year to year. With the increased technical aspect of the work professional men are entering the Service. They must also have certain basic qualities to measure up to ranger standard. These qualities include a sterling character, a distinctive personality, and an innate love of people. It takes unusual men to make the grade and qualify as rangers. Park personnel come in contact with thousands of visitors each year but it is the rangers who are best known for they work more closely with the visitors than any other government agency. The early guardians of the Park worked under the most difficult conditions but made a wonderful contribution in protecting our heritage. May the men that follow continue the ideals and policies that have been handed down by the National Park Service. The following list of permanent park rangers are from the Park service records. These permanent rangers entered the Service from 1927 on in the second decade of the Park service. August W. Flory—Born November 12, 1895, in Valley Falls, Kansas. May 1 1927, Park Ranger. May 31, 1929, Resigned. William C. Godfrey—Born June 8, 1890, in Armsby, Pennsylvania. November 1, 1927, Park Ranger. May, 1929 transferred to Crater Lake National Park as Chief Ranger. November 18, 1930, died from exposure while on patrol trip. Elwyn M. Heller—Born September 2, 1902, in San Diego, California. May 19, 1928, Seasonal Ranger. Served each summer (with exception of two) to the present time. Last five years on special duty as co-ordinator in handling complaints. Henry R. During—Born May 31, 1907, in San Francisco, California. June 20, 1928, Park Ranger. December 22, 1942, furlough to U. S. Army. February 1, 1946, returned to Yosemite. September 24, 1955, transferred to Rocky Mt. National Park as Chief Ranger. 1959, transferred to Jefferson National Expansion Memorial. Arthur Holmes—Born December 15, 1904 in San Diego, California. June 17, 1928, Park Ranger. July 2, 1930 transferred to Lassen Volcanic National Park as Chief Ranger. October 19, 1942, furlough to U. S. Army. May 16, 1946 to Yosemite. October 2, 1953, District Ranger. June 2, 1956, transferred to Grand Coulee National Recreational Area as Chief Ranger. Ralph H. Anderson—Born September 2, 1900, in Chillicothe, Ohio. June 1, 1929, Ranger, Yosemite. April 1, 1932, Information and Photography. August 10, 1951, Administrative Assistant. January 18, 1953, transferred to Washington D. C. Park Service Office, Publicity and Information Division. Vernon Lowery—Born January 17, 1905. 1929 to 193 1, Ranger, Yosemite. 1932, Ranger in Hawaii National Park. 1934, transferred to Yosemite. May 6, 1942, Resigned. Oscar F. Irwin—Born August 25, 1889, in Denlow, Missouri. July 4, 1929, Park Ranger. November 19, 1935, resigned on account of ill health. Emil F. Ernst—Born January 24, 1904. June 14, 1929, Park Ranger, April 1, 1933, Ranger Forester. December 4, 1941, to the U. S. Army until January 14, 1944. Returned to Yosemite as Forester. July 1, 1954, Park Forester, Yosemite.. November 4, 1957 transferred to Philadelphia, Pennsylvania, to Region Five Office on special assignment. 1958, Retired. J. Barton Herschler—Born March 21, 1897 in Ashland, Ohio. May 6, 1929 Park Ranger Yosemite. 1938 transferred to Rocky Mt. National Park as Chief Ranger. 1955 transferred to Millerton Lake Recreation Area as Superintendent. 1957 to Saguaro National Monument in Arizona as Superintendent. 1958 Retired. Gerald E. Mernin—Born February 7, 1907 in Stockton, California. 1929 to 1932 Seasonal Ranger in Yosemite. 1933 Park Ranger. February 11, 1935 transferred to State Hwy. Patrol. August 6, 1935 re-instated as Park Ranger in Yosemite. January 17, 1944 to January 1, 1946 to U.S. Navy. 1946 District Ranger. 1947 transferred to Blue Ridge Parkway as Chief Ranger. 1952 to Crater Lake National Park as Superintendent. 1960 in Region Four Office, Plans and Construction. Frank R. Givens—Born October 21, 1904 in Roff, Oklahoma. 1930 Park Ranger Yosemite. February 9, 1944 to May 30, 1944 Joshua Tree National Monument, in charge. 1944 Ranger Yosemite. July 4, 1945 to Pinacles National Park as Superintendent. Then to Acadia National Park in Maine as Superintendent. Now in Region Four Park Service Office Ranger Management. Floyd A. McKim—Born July 10, 1904 in Lansing, Michigan. May 27, 1930 Seasonal Ranger. 1933-1934 Seasonal Ranger Yosemite. June 6, 1938 Park Ranger. March 3, 1943 to Military Service. Samuel A. King—Born July 19, 1904 in Ashland, Wisconsin. May 18, 19 31 Seasonal Ranger Yosemite. January 7, 1938 Park Ranger. April 8, 1948 transferred to Saguaro National Monument as Superintendent, later to Joshua Tree National Monument, and his last move to Mt. McKinley in Alaska, status now Superintendent. Odin S. Johnson—Born August 1, 1902 in Eau Clair, Wisconsin. May 5, 1931 Seasonal Ranger Yosemite. August 21, 1941 Park Ranger transferred to Shenandoah National Park. November 2, 1942 transferred to Yosemite. 1951 District Ranger in Yosemite. 1961 intra-park transfer to Wawona District. Duane D. Jacobs—Born July 28, 1909 in Clark County, South Dakota., April 19, 1932 Season Ranger Yosemite. February 12, 1933 Park Ranger. February 5, 1.941 District Ranger. December 5, 1942 transferred to Joshua Tree National Monument, in charge. November 8, 1943 to U.S. Navy. January 28, 1946 returned to Yosemite. June 4, 1946 to Assistant Chief Ranger in Yosemite. April 4, 1953 transferred to Shenandoah National Park as Chief Ranger. 1955 transferred to Mt. McKinley National Park in Alaska as Asst. Superintendent and later to Superintendent. 1959 transferred to Omaha, Nebraska, Regional Office. Everett A. Milani—Born April 5, 1908 in Coulterville, California. 1932 to 1936 Seasonal Ranger in Yosemite. Cliff L. Anderson—Born 1899. 1920 to 1933 Ranger in Yellowstone Park. 1933-1935 Custodian of Colorado National Monument. September 1, 1935 Ranger in Yosemite. November 28, 1942 furloughed to war work. December 8, 1948 returned to Yosemite as Ranger. June 4, 1947 transferred to Muir Woods National Monument. Now Retired. Lemuel A. Garrison—Born October 1, 1903 in Bella, Iowa. October 17, 1935 Park Ranger Yosemite. November 15, 1939 transferred to Hopewell National Historical Site in Pennsylvania. November 1952 transferred to Big Bend National Park as Superintendent. 1954 transferred to National Park Service Office in Washington, D.C. 1956 transferred to Yellowstone Park in Wyoming as Superintendent up to this writing. Harold S. Hildreth—March 28, 1938 Park Ranger Yosemite. March 6, 1939 Resigned. James C. Skakel—Born November 18, 1899 in Tyndall, South Dakota. June 2, 1936 Park Ranger Yosemite. October 27, 1942 furloughed to war work in Navy Air Base. Kendrick M. Melvet—Born August 19, 1898 in Le Grand, Iowa. March 14, 1937 Park Ranger Yosemite. July 25, 1940 Resigned. Grant H. Pearson—Born July 13, 1900 in Letchfield, Minnesota. 1926 to 1939 Ranger in McKinley National Park in Alaska. 1939 transferred to Yosemite. June 30, 1942 transferred back to McKinley National Park as Chief Ranger, later promoted to Superintendent. Retired 1956. Marshall B. Evans—Born June 13, 1907 in Selma, California. 1938-1940 Park Ranger in Sequoia National Park. 1940 Ranger in Yosemite. 1949 District Park Ranger. 1956 to Fire Dispatcher in Yosemite. 1961 transferred to Crater Lake National Park, as Chief Ranger. John J. Hansen—Born July 13, 1911 in Chicago, Illinois. June 3, 1940 Ranger Yosemite. April 14, 1944 to U.S. Army. Returned to Yosemite October 9, 1944 as Ranger. November 25, 1944 Resigned. To the Post Office service in Yosemite. Lester M. Moe—Born January 21, 1910 in Portland, Oregon. June 1, 1940 Ranger Yosemite. November 10, 1942 furloughed to Navy Air Service. December 10, 1945 returned to Yosemite as Ranger. July 8, 1946 transferred to Engineer Department in Yosemite. May 10, 1949 transferred to Rainier National Park. November 29, 1949 transferred back to Yosemite to Engineer Department. George Soine—April 15, 1941—Ranger Yosemite. January 1, 1942 Resigned. Robert N. McIntyre—Born May 10, 1910 in Ashby, Illinois. 1939-1942 in CCC Forestry work. January 22, 1942 Ranger Yosemite. March 27, 1943 to U.S. Navy. April 15, 1946 returned to Yosemite as Ranger. January 1, 1948 transferred to Naturalist Division in Yosemite. April 22, 1950 transferred to Rainier National Park. May 1, 1953 returned to Yosemite as Administrative Assistant. June 25, 1959 transferred to Yellowstone Park as Park Naturalist. Donald Eaton—Born February 4, 1897 in Eaton, Colorado. Served as Ranger in Rocky Mt. National Park, Glacier National Park, Pinnacles National Monument, Death Valley National Monument and Petrified Forest in Arizona. February 18, 1944 Ranger in Yosemite. March 27, 1946 Retired. Oscar A. Sedergren—Born October 20, 1900 in Stephenson, Michigan. 1927 to 1944 Ranger in Mt. Rainier National Park. February 23, 1944 transferred to Yosemite as Chief Ranger. November 29, 1958 transferred to Olympic National Park as Assistant Superintendent. Wolfrum Joflee—Born March 20, 1916 in Seattle, Washington. April 21, 1944 Ranger Yosemite. November 17, 1945 Resigned. Louis W. Hallock—Born December 9, 1909 in Bridgeport, Connecticut. Served in Mammoth Cave National Park and Carlsbad National Park as Ranger three years. July 1, 1944 Ranger Yosemite. July 31, 1949 transferred to Crater Lake National Park as Chief Ranger. Later to Death Valley as Chief Ranger. Then to Sequoia National Park. 1960 to Bryce National Park as Superintendent. J. W. B. Packard—Born August 31, 1922 in Aurealia, Iowa. 1946 to 1949 Seasonal Ranger Yosemite. October 16, 1949 Park Ranger. January 22, 1951 transferred to Crater Lake National Park. Herbert B. Ewing—Born September 10, 1918, lived in Yosemite all his life. May 1, 1946 Seasonal Ranger. June 7, 1949 Park Ranger. 1957 Acting District Ranger. 1958 to District Park Ranger. Kenneth R. Ashley—Born December 10, 1920 in Oak Park, Illinois. January 18, 1947 Ranger Yosemite. June 2, 1956 District Park Ranger. June 27, 1958 transferred to Mt. Rainier National Park as Assistant Chief. F. M. Martischang—Born November 2, 1911 in Pierce, Nebraska. December 16, 1946 Park Ranger Yosemite. May 1, 1956 District Park Ranger. February 1, 1958 transferred to Muir Woods National Monument as Superintendent. John T. Mullady—Born April 10, 1915. February 12, 1947 Park Ranger Yosemite. June 2, 1956 transferred to Organ Pipe National Monument in Arizona as Chief Ranger. 1960 transferred to Glen Canyon Dam in Arizona. Glen D. Gallison—Born February 1, 1933. Raised in Yosemite. June 12, 1947 Ranger Yosemite. June 2, 1956 transferred to Naturalist in Yosemite. November 18, 1957 transferred to Olympic National Park as Park Naturalist. John M. Mahoney—Born November 27, 1915. July 27, 1947 Ranger Yosemite. September 27, 1953 to District Park Ranger. 1954 to Fire Dispatcher. May 15, 1956 transferred to Muir Woods as Superintendent. December 15, 1957 transferred to Park Forester in Yosemite. August 9, 1958 transferred to Forester in Region Four Office in San Francisco, California. Robert F. Uhte—Born December 28, 1923. June 22, 1948 Seasonal Ranger. April 25, 1950 Park Ranger. May 15, 1951 transferred to Region Four Office in San Francisco, California. Stanley McComas—Born February 8, 1903 in Anacorter, Washington. Five years at Kings Mt. Military Park. Two years at Shasta Lake Recreation Area. June 28, 1948 Park Ranger Yosemite. July 26, 1951 transferred to Yellowstone Park as Assistant Chief. 1958 transferred to Olympic National Park as Chief Ranger. Norman B. Herkenham—Born January 1, 1918. June 28, 1948 Ranger Yosemite. April 10, 1950 transferred to Assistant Park Naturalist in Yosemite. February 12, 1955 transferred to Yellowstone Park as Naturalist. 1959 to Park Service Office in Washington, D.C.
Robert H. Sharp—Born March 16, 1923 in Chicago, Illinois. May 28, 1949 Seasonal Ranger Yosemite. August 7, 1949 Park Ranger. December 18, 1951 furlough for medical treatments. Later to Yellowstone Park as Ranger. 1959 to Park Forester in Yosemite. Thomas R. Tucker—Born October 27, 1922 in San Diego, California. Worked with Blister Rust Control Crews in Yosemite. June 13, 1949 Park Ranger. June 23, 1958 to District Park Ranger Yosemite. Edward L. Parsegan—Born September 2, 1920 in Hasbrouck, N. J. April 26, 1950 Park Ranger Yosemite. September 5, 1956 transferred to Mt. Rainier National Park. John A. Townsley—Born April 18, 1927 in Yosemite. May 1, 1950 to 1955 Seasonal Ranger. October 8, 1955 transferred to Hawaii National Park as Park Ranger. October 9, 1957 returned to Yosemite. May 3, 1959 transferred to Oregon Caves National Monument as Managing Assistant. 1960 transferred to Park Service Office in Washington, D.C.
Orthello L. Wallis—Born May 1, 1921. June 25, 1950 Yosemite. January 3, 1954 transferred to Lake Mead Recreation Area, as Naturalist. John W. Henneberger—Born May 30, 1924 in Chicago, Illinois. June 30, 1951 Ranger Yosemite. March 31, 1956 transferred to Olympic National Park. 1958 transferred to Scotts Bluff National Monument as Superintendent. Walter H. Gammill—Born October 12, 1906 in Abbeville, La. Started Park Ranger 1931 in Yellowstone Park. October 28, 1951 transferred to Millerton Lake. 1952 transferred to Yosemite District Ranger. 1960 District Ranger Wawona District. Richard C. McLaren—Born October 4, 1921 in Grand Lake, Colorado. April 8, 1952 Ranger Yosemite. 1960 Ranger in charge at Chinquapin Station. 1961 intra-park transfer to headquarters. Charles R. Scarbrough—Born June 10, 1905 in Coeur d’ Lane, Idaho. April 24, 1953 to Yosemite from Acadia National Park, Maine, as Assistant Chief Ranger. June 21, 1954, killed by rock slide in Yosemite. Nelson Murdock—Born in Missouri (he didn’t say when). Six years with Forest Service in Idaho and Missouri 1933-1939. June 1, 1939 Ranger Sequoia National Park. September 12, 1954 transferred to Yosemite, Assistant Chief Ranger. 1960 transferred to Yellowstone Park as Chief Ranger. James L. McLaughlin—Born March 1, 1921 in Clearfield, Penn. November 10, 1954 Ranger Yosemite. August 30, 1956 to Arch Rock Station. February 26, 1959 to the El Portal Station, Yosemite. Dan S. Nelson—October 23, 1955 transferred from Yellowstone Park to Yosemite. To Park Fire Chief and Assistant Chief Ranger. 1961 transfer to Glacier National Park as Chief Ranger. Here ends record of Permanent Park Rangers up to 1956. 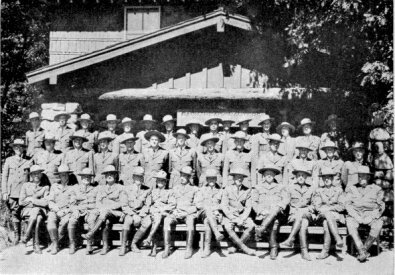 I am pleased to mention a few Seasonal Rangers that served many summers in Yosemite National Park. Wayne Westfall, Archie Westfall, John G. Sinclair, Cary T. Jackson, Grover Castor, Francis G. Carl, George W. Steward, James Murray, Clyde Quick and Ralph Jessen. These are considered Old Timers.